Periodically, I’m asked what the difference is between dogma and doctrine. People have the idea that they are kinds of Church teaching, but they’re not sure precisely what the difference is (or even if there is one). 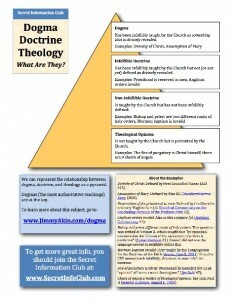 To help folks understand this, I’ve created an infographic that shows how dogma and doctrine relate to theology. Below you will see examples of what goes in each category!